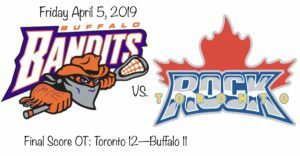 The Buffalo Bandits (12-4) visited the Toronto Rock (10-5) on Friday night April 5, with the hopes of increasing their lead in the East, but the Rock intended on continuing their home win streak. The very entertaining game between the two rivals had seven ties, including at the end of regulation. The OT winner was scored by an unlikely hero. Brandon Slade (2G) scored the game tying and winning goal, extending the Rock’s home winning streak to seven games and sending the 9,565 fans home happy. Final Score: Buffalo-11, Toronto-12. The game started quick for the Bandits as they scored 24 seconds into the game. Corey Small (2G, 2A) took a shot from the outside that goaltender Nick Rose (40 saves) thought that he had, but it rolled between his legs and over the line to give the Bandits a 1-0 lead. Rose made up for the soft goal with a great save on a short-handed chance by the Bandits. The Rock took the ball back up the floor and Johnny Powless (2G, 1A) scored on Buffalo netminder Matt Vinc (40 saves) with an outside shot to the short side for a power play goal that tied the game. With less than four minutes left in the first quarter the Bandits grabbed the lead for the second time as Dhane Smith (5G, 2A) beat Rose with a low bounce shot to the short side. A minute later the Bandits doubled their lead as Kevin Brownell (1G) scored on a bounce shot through Rose’s legs on a transitional feed from Nick Weiss (1A). The five-hole was a common theme through the game. The Rock got one back less than thirty seconds later as Dan Lintner (1G) cut through the middle, received a feed from Adam Jones (2G, 5A), dove through the crease and beat Vinc up high. The Rock had the last possession of the quarter and Rob Hellyer (4G, 3A) held the ball for 20 seconds as he ran around the outside. He beat his defender down low and jumped over the crease scoring with a bounce shot to tie the game at three. At the end of the first quarter the shots were Buffalo 15 – Toronto 13, and the score was tied at 3-3. The Rock continued their goal run and scored their third unanswered on their third power play opportunity. Challen Rogers (3A) and Jones passed the ball back and forth at the top before Jones fired a shot through the five-hole of Vinc to give the Rock their first lead of the game at 4 – 3. This game was Jones’s first game back after missing the last five with an injury. The Bandits tied it up six minutes into the quarter when Small scored his second of the game on a feed from Smith. He beat Rose with a nice shot to the far side. The Rock regained the lead with a nice behind the back pass from Tom Schreiber (3A) to Hellyer. He made no mistake with a low sidearm shot to beat Vinc. Special teams were at it again for the Rock as Hellyer scored a short-handed goal. His defender fell, leaving him an open lane to the net. He scored top corner for his hat trick goal giving the Rock a 6-4 lead at halftime. The shots on goal after two quarters were in favor of the Toronto 25-22. After halftime, the Bandits came out with all cylinders firing and they went on their own run, scoring four unanswered goals in just over six minutes. Smith scored the first goal on an outside bounce shot. Chris Cloutier (2G) beat Rose with a bounce shot from way outside. The bounce went over Rose’s shoulder as he went to his knees and the game was tied 6-6. Smith broke through two defenders and scored on another bounce shot giving the Bandits a one goal lead. The final goal of the run was the second of the night for Cloutier. On the power play he beat Rose through the legs increasing the Bandit lead to 8-6. It looked like the Bandits had discussed the need to take more bounce shots on Rose during halftime and it was working. The Rock ended the run when they scored their third power play goal of the game. Powless put his second of the night in the top corner over Vinc’s shoulder to cut the lead to 8-7. Jones tied the game up for the Rock a minute later with an outside shot through a screen. The third quarter came to an end tied 8-8 and the shots on goal swayed in favor of Buffalo 39-37. The fourth quarter started with the Rock on the penalty kill and less than thirty seconds in, Smith fired a hard shot from the top that beat Rose to the stick side to give the Bandits a one goal lead, 9-8. Less than a minute later, after picking up a rebound, Hellyer found a cutting Dan Craig (1G, 2A) in front of the net and he buried the ball over Vinc’s shoulder tying the game 9-9. Smith netted his fifth goal of the game after receiving a nice shovel pass from Shawn Evans (5A). He beat Rose over the shoulder to regain the one goal lead for the Bandits. After a Vinc save the Bandits moved up the floor on transition and Steve Priolo (1G) kept the ball during a two on one, beating Rose low far side to increase the Buffalo lead to two goals with less than half a quarter left in the game. Toronto needed to rally, and it started with Hellyer’s fourth goal of the game. After receiving a nice pass from Rogers, he let loose a hard-low shot and cut the lead down to one with 4:29 remaining. Less than a minute later Brandon Slade (2G) made a nice move to beat two defenders and put a shot off Vinc’s arm and in to tie the game 11-11. Both teams had chances in the last three and a half minutes to take the lead, but neither defense nor goalie were willing to give in. At the end of regulation, the score was tied 11-11 and the shots on goal were also tied 50-50. The Bandits won the opening faceoff in OT and were able to set up and get a shot on net. Rose stopped the attempt and called timeout to set up a play for their first offensive possession. 1:08 in, Slade became the hero as he received a pass from Hellyer, spun away from his check and beat Vinc with a low shot to win the game for the Rock 12 – 11. Final shots on goal were Toronto 52 – Buffalo 51. With the win the Rock clinch the season series against the Bandits which could be important as they finish off the season. Toronto (10-6) is back on their home court to face the New England Black Wolves (8-7) on Friday April 12, game time 7:30 p.m. EST. Buffalo (12-4) gets the week off and will return home on Saturday April 20, to host their Eastern Division rivals the New England Black Wolves, game time 7:30 p.m. EST.